Better late than never, here’s the annual 5th January post on the TrawsCymru T5 service, only one more to go to complete the series. But before we begin this instalment I should apologise: this post is not just about the T5. It reports, at some length, on related issues across the TrawsCymru network and concludes with comments on trains. Bygone Age: TrawsCambria 704, this route was identified as an upgrade priority and became the first TrawsCymru service. 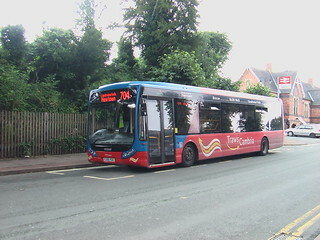 In 2010, the Welsh Government held a consultation on their long-distance bus network, known at the time as TrawsCambria. The results suggested that extra leg room, luggage space and access to toilet facilities should be priorities for improvement. 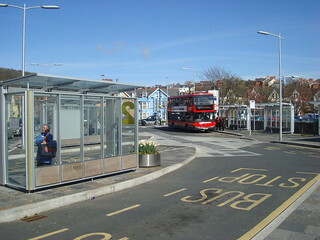 Within a year, it was announced that the network would be renamed as TrawsCymru with 12 new buses ordered for the two intended TrawsCymru launch routes; the TC1 (Aberystwyth-Carmarthen) and TC4 (Newtown-Cardiff). As noted last week in my third and final post of 2018, there is a reason for the lack of posts. After attempting to post weekly in 2017 (I failed, but the longest gap was six weeks) and complaining frequently that I didn’t have time for everything (I always seem to have too many projects on the go) I was advised to stop blogging. The time spent writing didn’t seem worthwhile given that I have received very few genuine comments (lots of spam though) and I am not aware of viewer numbers. I initially intended to phase out the blog, completing the backlog of partly written posts (mostly holiday travel reports) and then bringing the whole thing to a stop. My general level of busyness however has ensured that the partly written posts have stayed that way. 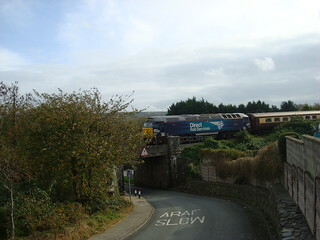 Over the limit: a class 57 leads the ‘Northern Belle’ through Goodwick on route to Fishguard Harbour. This is one of my most-recent photographs on Flickr. Those posts might appear one day, and I have one or two ideas for new posts for this new year, but no promises. Either way, as far as this blog is concerned I think we have reached the beginning of the end. A further setback is that Flickr have decided to introduce a 1,000 photo limit on free accounts. I had over 1,120 photos hosted on the platform, some solely for the purpose of this blog, and have therefore been forced to start deleting some photos. Any new pictures for the blog will therefore have to be hosted elsewhere (I’m using old photos that I had already uploaded to Flickr at the moment). But enough about me. As 2018 drew to a close I received two e-mails requesting that I contact the five Assembly Members representing my area in the National Assembly for Wales to ask them to vote against the proposals to build a second M4 around Newport. Apparently, the Assembly were expected to vote on the scheme by the end of that year. It soon became clear that the vote would not in fact take place until early 2019, but when it does I feel that the outcome will be profound. Sophie Howe, the Future Generations Commissioner For Wales, has spoken out against the project. The decision on whether or not to proceed could therefore have wider implications than decisions on previous road projects. For the first time a major road scheme could be shelved due, in large part, to the need to reduce car travel and greenhouse gas emissions; rather than purely on cost grounds or because of local environmental issues. On the edge of the levels: Severn Tunnel Junction is the nearest I’ve come to a photograph of the Gwent Levels, which the proposed new M4 would run through. Cancellation of the second M4 could therefore, at long last, be the beginning of the end for the traditional ‘predict and provide’ car culture; and the start of a meaningful shift towards sustainable transport. It might even set an example to other nations that building infrastructure is not always compatible with the need to combat climate change. If it sets such a positive precedent, it might just save life on Earth. On the other hand, if the decision goes the other way and the new motorway is built it would suggest that all the well-meaning legislation that aims to protect nature and the climate are worthless. The Future Generations Act, heralded as ‘groundbreaking’ by its promoters, would suddenly appear toothless and pointless. A dangerous precedent could be set; with road building and traffic growth continuing to be a favoured policy in government as it has been since the era of Dr Richard Beeching’s infamous ‘axe’. Climate change would likely become unstoppable; it could be the beginning of the end for many species. Apologies for ending on such a pessimistic note, but remember that is just one possible outcome. The plans for a second M4 could yet be abandoned; for all our sakes let us hope so. Either way, 2019 could be a crucial year; let’s do humanity proud. Last post for the year: at the going down of the sun, we will remember them. 43172 heads out of Carmarthen with a Pembroke Dock to London service; Intercity 125 trains operated normal passenger services to/from Pembroke Dock for the last time in 2018. Another year draws to a close… With just six days left of 2018, it’s high time I released another post so that I can say that ‘I made a crowd of posts in 2018’ (three’s a crowd; or so the saying goes). Unfortunately I cannot think of many noteworthy points about the past year to cover today; having already covered the handover of the Wales & Borders franchise in the year’s only non-winter post. The mainstream news has been dominated by arguments surrounding Britain’s intended departure from the European Union; I’m fed up of hearing about that. Politicians; please can we forget about it and get down to the serious business of tackling climate change? There is a reason why my blog has been so quiet in 2018, and that is unlikely to change much in 2019. More on that (very) early next year (I hope). In the meantime, I hope you will enjoy the ‘Christmas present’ I have prepared for any readers. This ‘present’ takes the form of a belatedly completed video project, featuring First Great Western’s Intercity 125 trains, which bowed out on ‘The Pembroke Coast Express’ at the end of the summer 2018 season. Summer in Pibwrlwyd: the westbound ‘Pembroke Coast Express’ approaches Carmarthen in June 2016. The Pembroke Coast Express is the focus of the video, which I originally hoped to publish during 2017 (Visit Wales’ Year of Legends). My project is therefore coming to fruition a whole year late. Still, it is a slightly better performance than Network Rail who, sadly, have missed the ‘Hendy date’ for December 2018 completion of Paddington-Cardiff electrification. My excuse is equipment failure; the computer I use for video editing died and it took me many months to find a suitable replacement part, replace it and recover the data. I must confess that I have ‘cheated’ a little since not all the trains featured in the video are the ‘Pembroke Coast Express’. There is probably footage of the two nameless Great Western workings to/from Pembroke Dock in there and the Carmarthen – London Paddington service makes at least two appearances. There is even one shot (I think only one anyway) of a London-Swansea service and one that is not even a train to or from Wales! 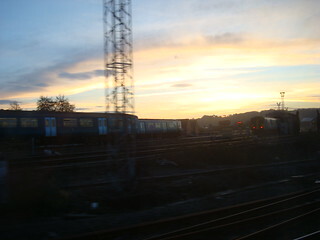 Sunset On Arriva Trains Wales: class 150s outside Cardiff Canton depot in December 2016. Removal of the Arriva branding from these units started in late summer 2018 in preparation for the franchise change. A fifteen year era has ended. KeolisAmey, a joint-venture, have this morning (Sunday 14th October 2018) taken over the running of the Wales & Borders rail franchise from Arriva Trains Wales. Arriva’s 15-year reign, thanks to the government of the time specifying a ‘no-growth’ franchise, has brought little in the way of improvement. That is supposed to be changing, with Passengers of Reduced Mobility legislation due to come into force in a little over a year. This time last year*, I complained about the extremely indirect route taken by the TrawsCymru T5 bus service and hinted that in 2018 I might follow up with my vision of how it should be. Well; 2018 is now here, and so is the promised story. * Ok, not exactly this time; the annual 5th January T5 post is about 14 hours later this year than in 2017. We’re walking in the air; we’re floating in the midnight sky… Prior to the referendum of June 2016, the two sides of the debate regarding whether to take the United Kingdom out of the European Union gave a range of arguments to support their positions. Some of these arguments, on both sides, were probably valid; others perhaps less so. One of the leave campaign’s biggest arguments was the issue of ‘Freedom Of Movement’ across the European Union. Immigration figures exceeding emigration is, or was, apparently a serious concern for certain sectors of the population. There is however a difficult problem, if the UK border force are to be able to stop people moving to this country without permission they need to check everybody’s passport at the border. This is not to much of an issue at ports and airports, where travel is slowed by embarking and disembarking from ferries and aircraft anyway. A land border however, where people are used to uninterrupted travel on foot, bike, bus or train, or in car, is rather more difficult. This was clearly a sticking point during the first stage of negotiations with the EU. 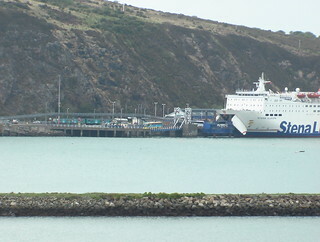 The only option for avoiding passport controls on the border between Northern Ireland and the Republic appeared to be to have Northern Ireland effectively remain within the EU, with freedom of movement, and introduce passport controls on routes between the island of Ireland and mainland Britain. I was concerned however that, with the Scottish desire to remain in the EU, a similar package might be demanded by Holyrood; which would have resulted in a land border with England (to the detriment of the cross-border rail links). Instead, it now appears that the whole United Kingdom will need to maintain alignment with certain rules of the EU, in order that hard borders are not necessary. The leave campaign’s dreams of abolishing the freedom of movement between the EU and Britain are now looking almost as outlandish as the squadrons of flying snowmen in Channel 4’s vintage Christmas animation. 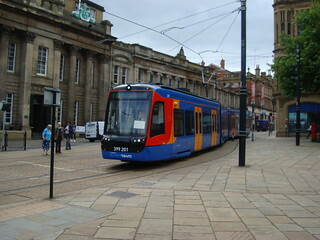 Within the United Kingdom however, freedom of movement within the public transport system can be limited. For some time now, I have been concerned about a certain aspect of the Cardiff/Newport Metro proposals. 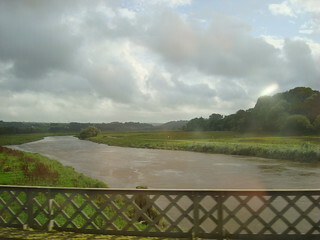 It is possible that the project will include a new station to serve Caerleon. That in itself would be no bad thing, in fact I am strongly in favour. The issue is that the likely service offer is an hourly train between Cardiff Central and Abergavenny. 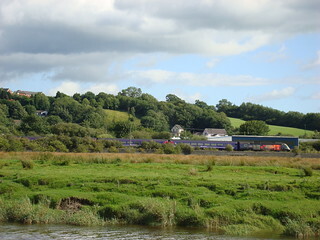 As with stations on the ValleyLines network, the most-important market for travel to/from Caerleon is probably commuting to/from Cardiff and Newport. 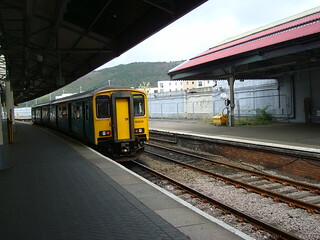 The proposed Cardiff-Abergavenny service would thus cater for that core market, but terminating at Abergavenny as planned could limit the station’s usefulness for people with other travel patterns. Off The Metro? 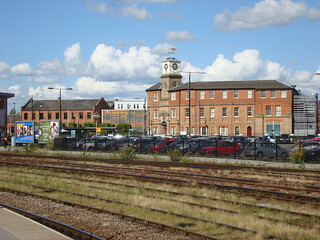 Hereford station, which could unfortunately be left beyond the Cardiff/Newport Metro services serving a possible new Caerleon station. It is my opinion that the proposed hourly stopping service between Cardiff and Abergavenny should instead run through to Hereford, where the line to Worcester branches off the Welsh Marches Line. 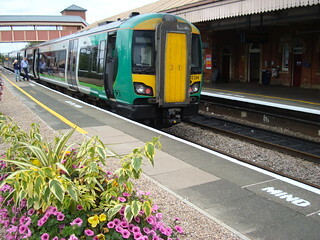 Worcester is probably not an important destination for many people in Caerleon, but extending their trains to Hereford would make places like Worcester just one change of train away from them. To reach Birmingham with just one change otherwise, the people of Caerleon would first have to travel south to Newport (thus heading in the wrong direction). Onward Connections? 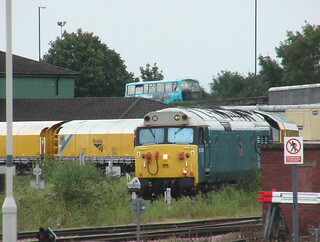 Trains for Birmingham and London serve the line from Hereford through to Worcester, where this photo was taken. 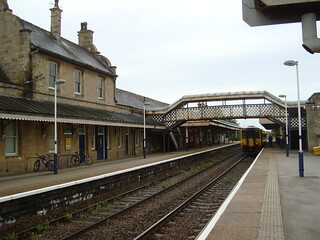 Hereford also has trains along the Cotswolds line to Oxford, which would be two changes away from Caerleon if the trains terminated at Abergavenny (although changing at Newport and Didcot might be quicker, thanks to 125mph running on the Great Western Main Line). Even so, I feel that running Caerleon’s trains through to Hereford, instead of stopping them short of that important junction station, would be severely limiting the ‘freedom of movement’ by rail for the people of Caerleon. That’s it for this blog for 2017; all that is left is for me to wish you a Merry Christmas and a happy new year. Following on from ‘Lost In Leicester’, this post records the events of one Wednesday; our last full day on and around the East Midlands rail network during our August 2017 holiday based in Leicester. 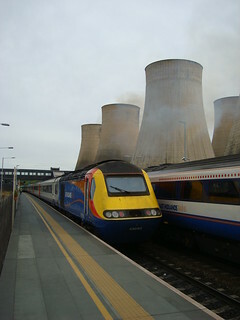 Power & Pollution: 43060 emits a plume of diesel fumes as it powers away from East Midlands Parkway. We need electrification. In the morning we took the 09:25 from Leicester to East Midlands Parkway. 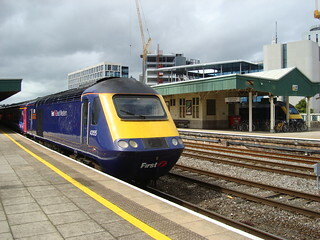 This was an Intercity 125 set powered by 43081 and 43060. 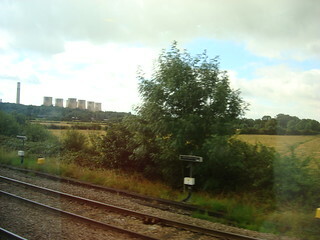 I photographed the latter, which was on the rear of the train, as it left East Midlands Parkway with the cooling towers of Ratcliffe-on-Soar power station as a backdrop. I had previously planned to change trains here in the afternoon to take photos of passing trains with the power station in the background, but it would have involved spending an hour on the station. My grandmother was concerned that it might not be a nice place to spend an hour (she hadn’t noticed a waiting room when we had passed through previously) so I amended the plan to have 15 minutes for photography in the morning instead. During that time, I was able to photograph a class 222 ‘Meridian’ and a southbound class 158 before our next train, 158810, arrived. This service was due to depart East Midlands Parkway at 09:56 and we stayed with it all the way to its destination (Lincoln). 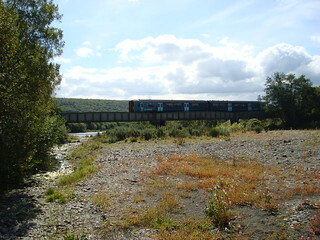 The route crosses the East Coast Main Line on the Newark flat-crossing; a rather rare arrangement of track particularly when one of the routes is such an important main line. Luckless Lincoln: 153376 and 153383, awaiting their next duties in Lincoln station. I had pondered several other possibilities for the day’s journeys, including other routes to/from Lincoln, but I was concerned about the quality of rolling stock I might find. These concerns were justified on arrival in Lincoln; apart from our train everything present was a single class 153, which the exception of the Pacer on the Northern service to/from Sheffield. It Gets Steeper: the bottom of ‘Steep Hill’ in Lincoln. I had allowed just over two hours in Lincoln and this was just as well because our walk up to the cathedral (a lot more impressive than Leicester’s) and back took over an hour. 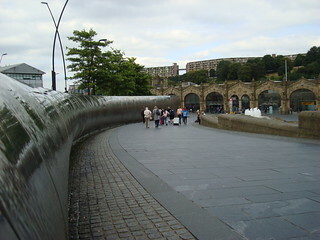 Our route took as past the Corn Exchange and up a street named, I kid you not, ‘Steep Hill’. It certainly lived up to its name, rather surprisingly given the miles of largely flat country our train had travelled through to take us here. 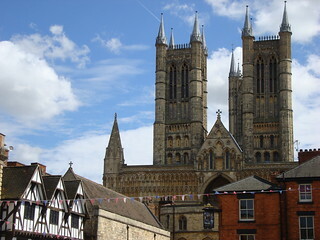 Three Tall Towers: Lincoln’s very impressive cathedral, seen from just outside the castle. 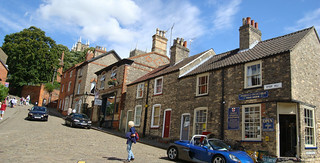 At the top of the hill, as well as the cathedral, was Lincoln castle; only a small part of which was visible from where we were walking. 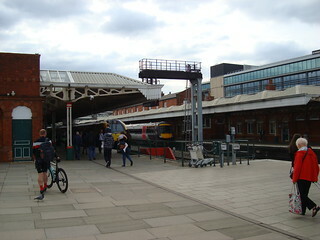 Back at Lincoln station, we boarded the 13:37 Lincoln to Leicester service, formed of 156415. This we left at Nottingham, having spotted what appeared to be the remains of a previous Nottingham station just prior to our arrival at the current one. Red And (slightly) Dead: a composite image of the slightly odd, but impressive, Nottingham station. In the time we had available, we took a look around part of the current station and spotted a canal with old warehouse buildings alongside. The station is rather grand in my opinion but I wasn’t entirely sure whether I liked the monochrome colouration of the buildings (slightly different shades of red; presumably purpose-made brick). 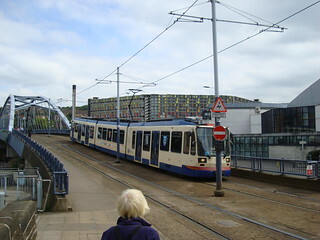 My grandmother seemed to dislike the whole design, but we both agreed that the new bridge which carries the NET (Nottingham Express Transit) trams over the mainline station is not attractive. 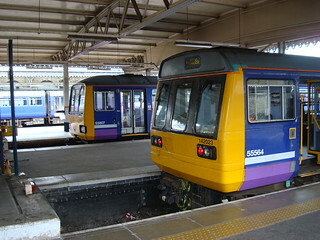 Not So Super Sprinters: the pair of 153s at Derby. Despite their failings, the class 153s are officially known as ‘Super Sprinters’, just like their large-windowed class 156 cousins. 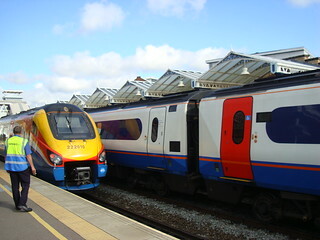 Our next train, the 15:20 departure, was the only time our luck failed us in terms of East Midlands Trains rolling stock. 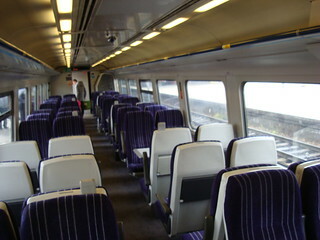 This service, bound for Matlock, was formed of a pair of class 153 units. Ours was 153319 and the other was 153302. The problem with class 153s is that their windows are too small to allow the bays of four seats around a table to properly align with them. 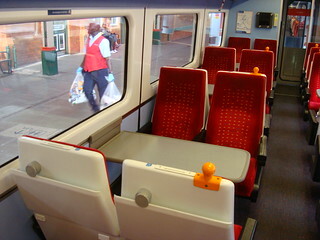 Passengers on at least one side of the table therefore have their view interrupted by a window pillar. I suspect the only way of making these trains work for passengers would be to go for an airline-style seating layout throughout with only one row of seats per window (two wouldn’t provide sufficient legroom). Fortunately, we had already done this route so an impaired view wasn’t much of an issue and we were getting off fairly soon anyway (at Derby). Nowhere To Hide: a shot of Melton Mowbray station from earlier in the week; the waiting rooms here are probably closed for the night by the time the evening train from London arrives. 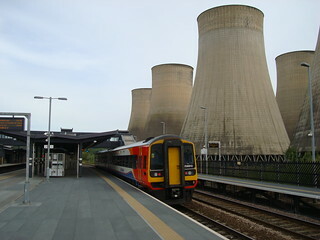 The next leg was considered the ‘do or die’ section of our tour of the east midlands rail network. Our service was the 16:36 Derby to London St. Pancras, the only service of the day from Derby to Corby via Melton Mowbray and Oakham. 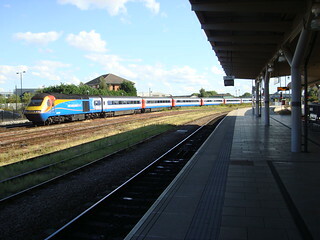 In order to travel the section of line between Oakham and Corby in both directions, we would have had to wait just over an hour in Kettering for the day’s only through service from London to Melton Mowbray, which terminates at the latter and would have left us with a wait of over 40 minutes there for a train back to Leicester. We wouldn’t have got ‘back to base’ until 20:46, which was a worry. Thus, I would have to try and observe both sides of the line in a one-way trip. Another worry was that this service was the only London service we had seen formed of a 4-car Meridian, 222103 on this occasion, rather than a longer train. Could we get a decent seat? After an agonisingly long wait standing by the door, the guard finally unlocked them and we boarded and managed to find good seats. So far, so good. The highlight of the trip was to be the Harringworth Viaduct, apparently also known as the Welland Viaduct and as the Seaton Viaduct. A larger number of tunnels than anticipated contributed to me not being entirely sure we had reached it, and I failed to spot the trackbed of the closed line that passes under the line near one end of it. After a fairly long station dwell at Corby, the train continued to Kettering (with little sign of the promised electrification works) where it would have another long wait; and where we were getting off. Although I would have liked to go back over the line, the fact the waiting room at Melton Mowbray would almost certainly be closed for the night (making the long wait there very undesirable) didn’t help the case for that option. I also wanted to get back to Leicester at a reasonable time so opted to board 222012 which was waiting at Kettering with a Sheffield service that took as directly back to Leicester. Last week’s post, The Mainlines Of Yesteryear, was intended to report on the 15th of August, the Tuesday of our holiday based in Leicester. However, that post became rather lengthy so I decided to break it into two parts. At the ‘interval’, my grandmother and I were on board a class 156 DMU, 156415, which had been due to leave Matlock at 15:37. 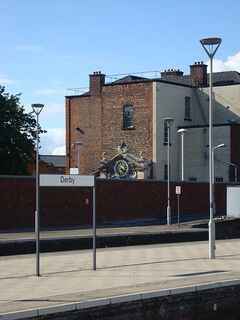 We left this train, which would then continue to Newark Castle, at Derby. Considering that Derby is home to the last remaining British Rail works that still builds new trains, its station (as we had seen briefly earlier in the week) is a rather bland affair that does little to suggest that heritage. With about 50 minutes in Derby this time, I intended to seek out what remained of a traditional station. 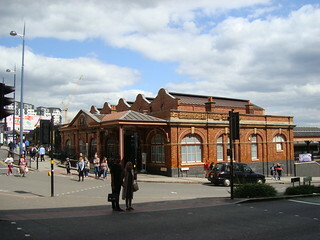 A fine 19th century railway building which is visible from the platforms is ‘The Roundhouse’, which I had already featured in the background of photographs taken on the first day of the holiday. Now a venue for various events, this structure has found a new use after become surplus to the rail industry’s requirements. Most of the steam-era station buildings not been so lucky. 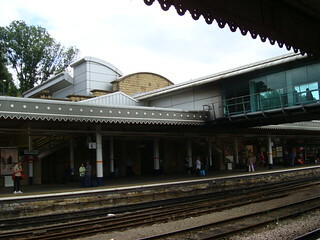 The platform furthest from the roundhouse however retains a number of two-storey and three-storey brick buildings which appear to predate the operational parts of the station. At least one of these is adorned with Network Rail logos, so is presumably in use, but none of them are particularly ornate. 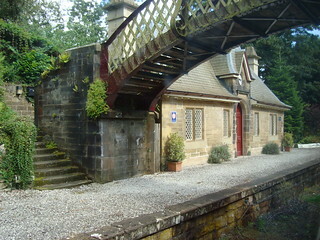 The Old Clock: ornate former station entrance half-hidden behind the wall at one end of the platform. The sole visible relic at the opposite end of that platform is a different story. Largely hidden from view, a dragon-topped clock stands behind a wall. Wikipedia tells me that this clock was once part of the Victorian station entrance but was moved to its current location in the station car park when the rest of the building was demolished. Today’s entrance is rather less grand, but besides investigating the architecture our stop in Derby served another purpose. Following the tribulations on our northbound journey from Wales, I had decided that travel on CrossCountry’s intercity routes without a reservation was too risky. We therefore visiting the ticket office in Derby station and booked our seats for the XC leg of the journey back to Wales. Coaches Close To Home? 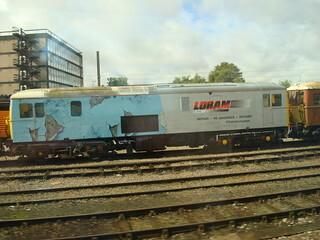 IC125 in Derby; the mark 3 coaches were apparently built at Derby works. While we were on the station, a full East Midlands Trains IC125 set spent a short while in one of the sidings adjacent to the station, presumably heading to, from or around the city’s Etches Park train maintenance depot. After that had gone and I had collected a shot or two for my planned video regarding the recent cancellation of electrification projects, we returned to Leicester for the night on the 17:01. My photographic record suggests that the Meridian working this service was number 222005. 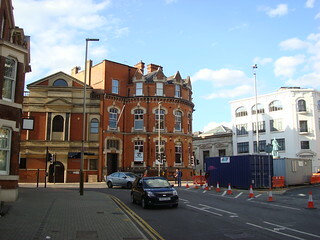 As I’ve been discussing Derby station you were probably wondering why the title of this post is ‘Lost In Leicester’. That name came about because, in the evening after returning from Derby, we took an unintentionally extended tour of Leicester. We knew there was a cathedral to be seen, where my grandmother was hoping to ‘see’ Richard the third, and George Bradshaw’s 1863 ‘handbook’ told of a former castle. In order to see these I had planned a circular route of just over 1.8 miles on Google Earth. We were heading in the planned direction when we set off from the railway station alongside the A594 ‘Waterloo Way’ dual carriageway but soon came adrift. I knew we needed to turn right at some point, but down on the ground I wasn’t sure when. In fact we overshot the right turn I had planned, but only slightly, and were treated to the pedestrianised ‘New Walk’; a pleasant tree-lined street, as a result. So far so good. Our big error came when we came almost to the end of ‘New Walk’ and needed to veer slightly to the left in order to head east towards the river Soar. Instead I think we must have turned sharply into King Street and began heading almost due south, because we passed a neat brick-built crescent and then came to Leicester prison. Wrong Turn? 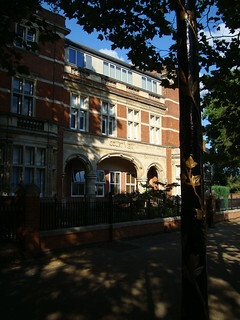 This is Welford Place, Leicester, at the junction of Newarke Street and Welford Road. New Walk ends just round the corner out of shot to the right. As far as I can tell, we then headed north up Welford Road almost to where we had left ‘New Walk’ and then turned left into Newarke Street as we should have done earlier. I cannot remember the full details of the muddle we got ourselves into, but seem to recall deciding that the signposts for pedestrians were useless and that only the maps on the signs could be trusted. I think we even passed one signpost for the cathedral and then, further along the same street, saw another pointing in the opposite direction. 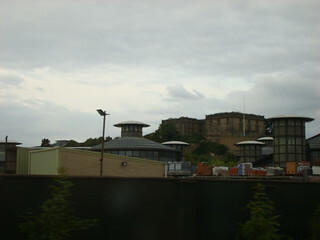 Eventually, we came to the street called ‘Castle View’, mentioned in my Bradshaw’s. Spanning this lane was a gateway, presumably one of two Bradshaw described (one as being in ruins) as being remains of the castle. Beyond that gateway a brick building, the Leicester Castle Business School, stands in a courtyard. If the information boards are to be believed, this contains another part of the old castle, possibly the great hall mentioned in the historic railway guidebook. 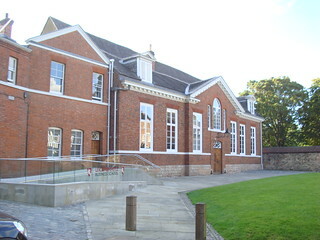 Castle Hall: the business school building inside the castle walls. 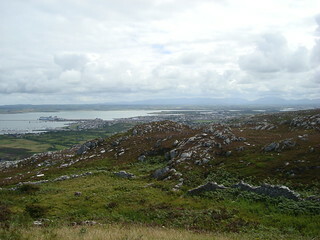 Also surviving the centuries is a tall mound that, Bradshaw writes, is all that remains of a castle destroyed in 1645. Given that this is the same site as the gatehouse and great hall mentioned above, I am a little confused by the guide; are the mound and gatehouse somehow part of separate castles? Or was Bradshaw simply too keen to describe features as the sole surviving section of the castle? 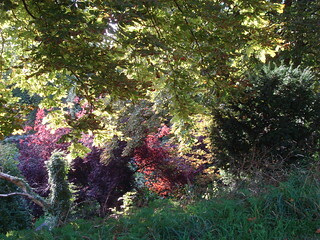 After a rest on top of the mound, which according to the information boards has been reduced in height, we descended into the public gardens behind the business school building. 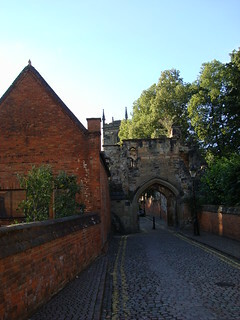 The ‘Castle Gardens’ as they are called run along the bank of the River Soar, we headed north to St Augustine Road and, as planned, turned right to head for the cathedral. 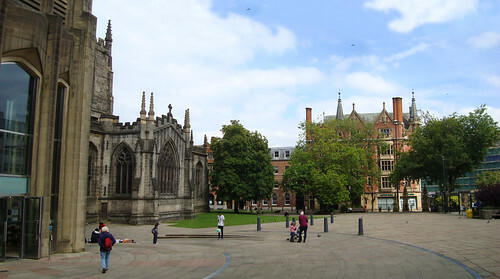 The resting place of King Richard III, as cathedrals go, is rather restrained. 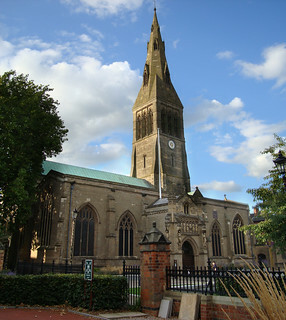 I have probably seen lesser churches which are more impressive. 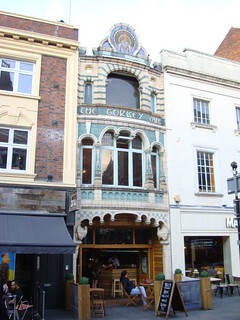 There were however a few interesting architectural features on and around some of the surrounding buildings. Unfortunately, by this point it was too late for my grandmother to go inside the cathedral. From there we continued as planned, or not far off course, towards our temporary place of residence. On the way, we passed another few interesting buildings and stopped off at the restaurant we used for most of our evening meals during the week. Getting lost had extended our walk from the planned route of around 1.8 miles to possibly 2.5 miles but we had seen what I set out to see so the evening wasn’t a total disaster. This post was nearly titled ‘Back To The Past’, since it follows on from ‘Back To The Future’, the previous instalment in my ‘Roving The Midlands’ travel report series and features a visit to a heritage railway. Our travels on Tuesday 15th August began with a short hop along the Midland Main Line from Leicester to Loughborough, the home of Brush Traction, on board ‘Meridian’ 222010 which formed the 09:30 to Sheffield. 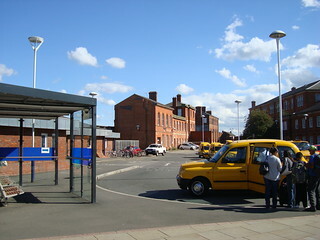 There we temporarily bade the modern railway farewell and took a taxi to the other Loughborough station, home of the persevered Great Central Railway’s locomotive fleet. 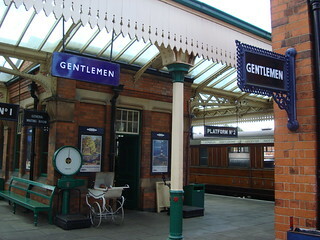 Great Central Station: entrance to the heritage railway in Loughborough. The engine shed at Loughborough we left for later in order to board the 10:15 steam service for the journey along the length of what is claimed to be Britain’s only mainline heritage railway. 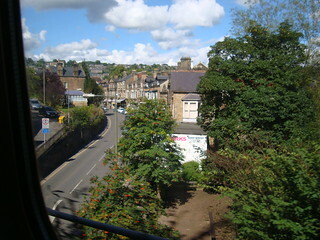 The route was indeed once part of the Great Central Railway’s main line, which according to Wikipedia opened in 1899. Around 70 years later much of it was considered to be unnecessarily duplicating other main lines and therefore closed. End Of The Line For Steam: our train at Leicester North, with the rusty totem signage just visible on the left. The particular section that has been reopened as a ‘mainline heritage railway’ certainly is a ‘duplicate route’ as the train was taking us back towards Leicester. 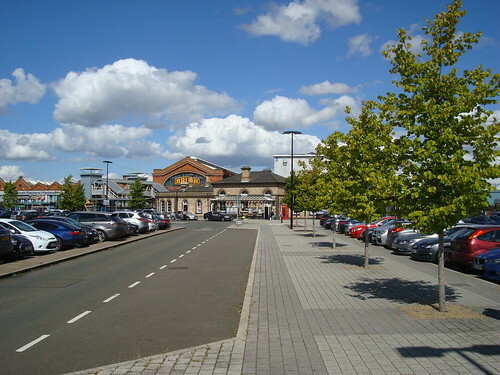 The southern terminus of the heritage operation, Leicester North station, is however a long way from the city centre and national rail station, hence my decision to join the heritage railway at its northern end. The totem signs here were rusty; perhaps artificially so since this station is presented in 1960s style (which of course was when the line closed). The transitional era depicted also permits the station staff there to wear uniforms featuring the British Rail double-arrow logo. 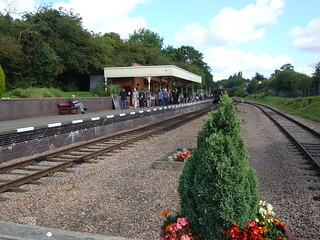 After the engine had run round, we headed back north to Rothley station where we were due to arrive at 11:17. I can only assume that the shade of green coating the signal box and various features on the platform was used by the original Great Central Railway company, although the warning signs on the foot crossing were London & North Eastern Railway (LNER) ones. Somewhat inexplicably, these platform features included several Great Western Railway benches; I don’t think this was ever G.W.R. territory but I’m not an expert on railway company boundaries. Which Great Railway? 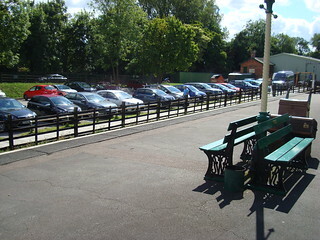 GWR benches on the platform at Rothley. Our next train, due at 11:35, was the other rake of the two in service on the day and would take us back to Leicester North. 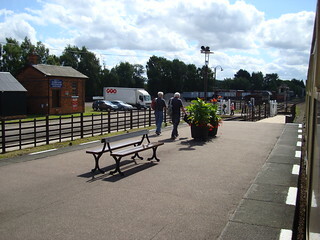 While waiting for this at Rothley my grandmother visited the café and I took a look at the garden railway. As a result of this we only just made it back onto the platform in time to catch the train (the staff may even have held it briefly as they saw us heading for it). To my slight disappointment the 2-6-0 locomotive hauling the train was the same type as the one hauling the other set of coaches, an LMS/BR class 2. 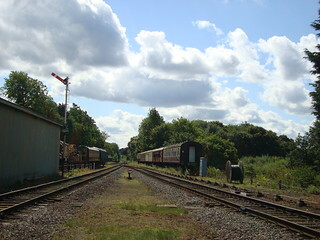 Single Southwards: two tracks merging into a single-track at the southern end of Rothley station. The section between Rothley and Leicester North is, like other heritage railways, single-track and traversed (at least on the day of our visit) at low speed. The first impressions of a passenger starting their visit to the railway from Leicester North might therefore be one of a ‘sleepy branch line’, despite the fact that this was once the Great Central Main Line. 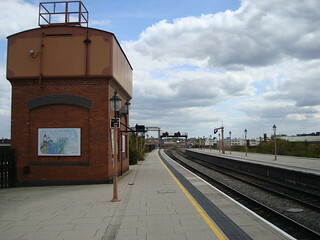 Single Platform: Leicester North Station with the bricked-up entrance to the now-demolished original island platform just visible above the train. 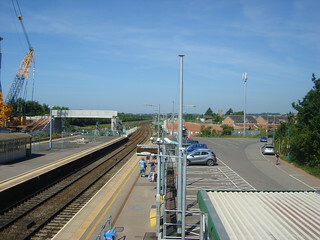 Leicester North is the railway’s only station with just a single platform at the side of the formation, and was built from scratch for the heritage operation. Intriguingly, the other three stations (Rothley, Quorn & Woodhouse and Loughborough) all have an island platform between a pair of tracks (so two platform faces). 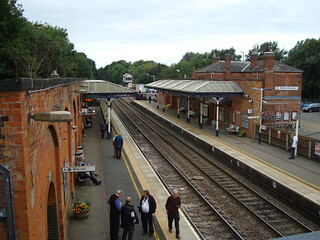 A former station on the site of today’s Leicester North had the same island platform arrangement but was demolished due to it being in poor condition. On The Double: Quorn and Woodhouse station on the double-track Great Central main line. Staying with the second rake we departed Leicester North on the 12:05 service, this time bound for Loughborough. North of Rothley, the ‘mainline’ claims of today’s Great Central are far-more justifiable as the route is double-track. Unlike on other heritage lines, our train was thus able to pass the other without stopping to exchange single-line tokens, although this happened to occur only moments before we called at Quorn & Woodhouse anyway. We did however still appear to be limited to the same low speeds of the country’s various preserved branch lines. Strange Route: the places listed on the side of the teak carriage do not appear to belong to a single train service. 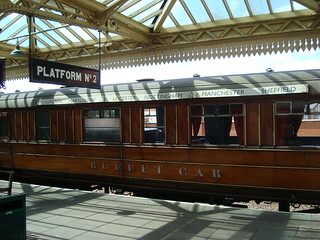 As with other heritage railways, most of the coaching stock appeared to be of the British Railways mark 1 design. Back at Loughborough however I was able to photograph two older vehicles, one (out of service) in LMS livery and an LNER varnished teak buffet car in our train. The latter had traditional destination boards on the side with a curious list of place names: Marylebone, Leicester, Nottingham, Manchester and Sheffield. All were presumably served by the original Great Central but surely a train service would not have followed such an indirect route. Blues And Greens: the slightly uncomplimentary colour schemes on the Great Central station at Loughborough. The colour scheme at Loughborough’s heritage station was a curious mix of British Railways (eastern region) blue and black and green seen at Rothley. Surprisingly, the railway permits extensive public access to their locomotive shed at Loughborough. This provided us with the opportunity to see much of the railway’s varied locomotive fleet, rather than being limited to the ones in service. The size of these impressive machines can really be appreciated when viewed up-close at ground level rather than from a station platform. 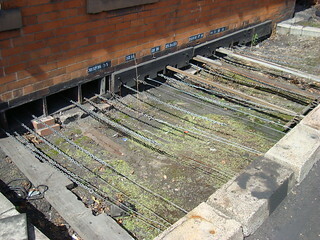 Ye Olde Signalling Cables: chains and wires coming out of Loughborough signal box. Also on show was an array of chains and cables emanating from Loughborough signal box. 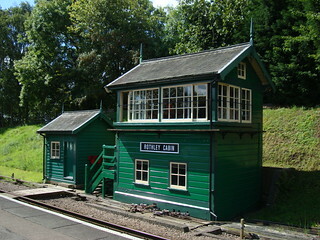 The building itself is a fine example and, like many others across the UK railway network, puts the ‘re-locatable equipment buildings’ used for modern signalling equipment to shame aesthetically. ‘Re-locatable equipment building’, by the way, I believe is just a posh way of saying ‘portacabin’. As per usual, clicking the photograph will take you to my Flickr page where you will find a shot of the signal box along with other photographs from the holiday. At the time of posting, the album is not complete, there are still more photographs to upload from this trip. 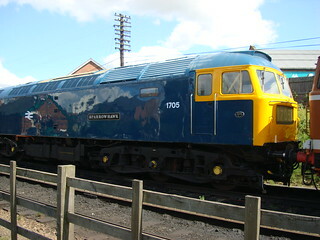 Shiny Sparrowhawk: class 47 diesel locomotive outside the shed on the Great Central Railway. Once again, we then had to hurry to catch a train, this time the 13:58 East Midlands Trains service from the other Loughborough station. This meant I did not have much time for looking around the small museum at the other end of the heritage railway’s platform and, to my annoyance, we forgot to ask the question that had in part brought us here. That question was whether the ‘only mainline heritage railway in Britain’ ever ran trains above the normal low speeds with members of the public on-board. I have read that the line is permitted to run faster, up to 75mph for testing. They also run demonstration travelling post office trains at above the normal heritage railway speed limit of 25mph during gala events. What I do not know is whether those gala events also include the operation of passenger trains at speeds greater than 25mph. Unfortunately, we felt we did not have time to double back and ask the question, so carried on our walk to East Midlands Trains’ Loughborough station. I think we arrived with about 10 minutes to spare, so I was able to obtain some photographs of the station with the Brush Traction works in the background. With one heritage mainline, the Great Central, behind us we switched to another when we boarded Diesel Multiple Unit 222015 which was bound for Nottingham. 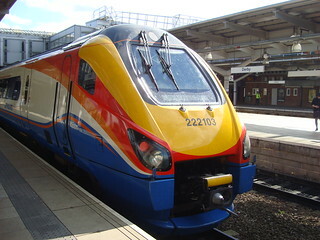 The class 222 units are only middle-aged, yet represent how very outdated the Midland Main Line is. 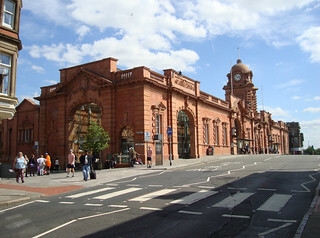 In 1981 British Rail recommended a programme of electrification which prioritised electrification of the Midland Main Line, plus the Birmingham to Derby and Leicester routes, ahead of the East Coast Main Line north of Newcastle. 36 years later, diesel trains built at the time are becoming life-expired and electrification north of Kettering on the Midland Main Line (MML) is once-again without a funding commitment from the government. 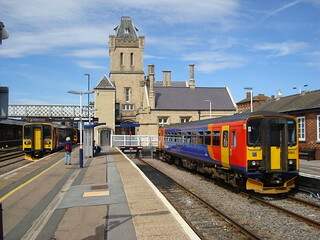 Loughborough Midland: the East Midlands Trains station in Loughborough, with the Brush Traction works behind. Meanwhile the Great Central Railway is constructing a new bridge over the Midland Main Line in Loughborough, which will reconnect the line with another stretch of the Great Central Main Line which has also reopened as a heritage railway. 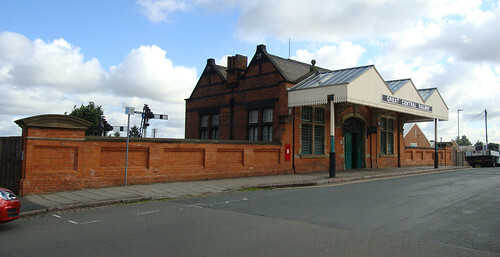 According to a notice on the Leicester North to Loughborough line, the original Great Central Railway bridge over the MML was demolished to make room for electrification of the MML. Electrification that still has not happened; a modern railway this is not. 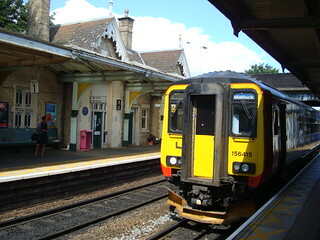 We left the Meridian at Beeston to await the 14:25 service to Matlock, which was formed of ‘Super Sprinter’ 156415. 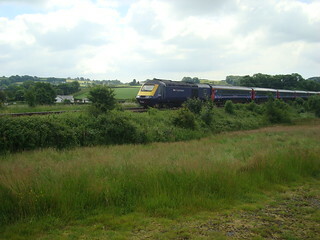 The run past Attenborough and back to the double triangular junctions south of Long Eaton offered tantalising views of pleasant-looking lakeside walks, primarily in Attenborough Nature Reserve, before the train rounded the north side of the southern triangle and joined the MML’s western branch towards Derby. Staying on-board, we were taken up into the very different terrain of the Peak District. 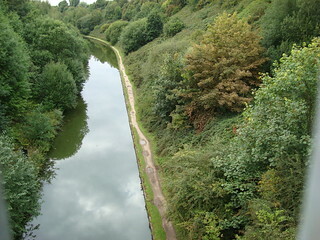 Now merely a branch line, the Matlock route was once part of the now-severed main line from Derby to Manchester. One of the railway guidebooks I was carrying told us to look out for the curious mix of architecture found at some of the stations on the branch, and I managed a photograph of one station buildings through the train window. End Of The Line: the Super Sprinter that look us to Matlock rests before its return journey. 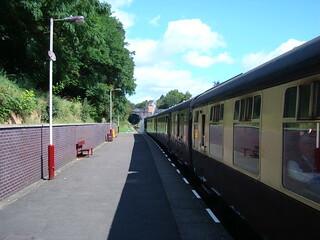 It is possible to travel a little further than Matlock by changing for ‘Peak Rail’, another heritage line, which operates almost as far as the Peak District National Park. Neither that nor the East Midlands Trains service actually cross that boundary however. My plans did not include a ride on Peak Rail, so after I few photos of Matlock station had been taken I re-boarded the Super Sprinter to head back down the Matlock branch. This post terminates here, but the day was not quite over. In a fortnight’s time, I hope to bring you a report on the following day’s travel. The story of Tuesday’s events, following our departure from Matlock, will be continued next week if possible. 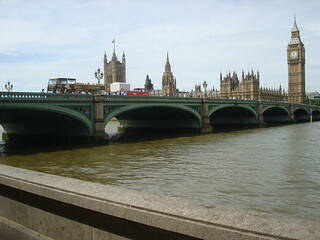 ‘Big Ben’, the great bell of Westminster’s iconic clock, has fallen silent. Thankfully, that silence is only a temporary one. Metaphorically however it appears that a different clock may now at last be ticking, counting down the seconds until a seismic shift in the long-established political landscape is achieved. Tomorrow, Monday 30th October 2017, MPs will debate the introduction of proportional representation for general elections in the UK. This follows a petition on the UK parliament website which attracted 103,495 signatures over a six month period. This exceed the required threshold of 100,000 signatures that triggers a debate in parliament. It is a small step along the path to a fairer system, we have won a battle but not yet the war. Truth be told however, the First Past The Post voting system might not be the only aspect of our democracy that is seriously outdated. A proportional system will require larger constituencies, each represented by multiple MPs. If the boundaries of these were drawn up on the basis of population, some would be so large that their MPs would be unable to effectively represent the needs of constituents across their entire area. I believe the House Of Commons can seat only 427 MPs at a time. This number is divisible by 7, which is also the number of members representing each region in the proportional element of Scottish parliament elections. Assuming 7-member constituencies, electing 427 MPs to the Westminster parliament would require 61 constituencies. Based on population sizes, 51.301 of those would represent England. With a little rounding, we could have 50 constituencies in England, 6 in Scotland, 3 in Wales and 2 in Northern Ireland. Personally, I do not think Wales can be effectively represented with fewer than six constituencies, so this is clearly not going to work. Powers To Follow? This red double-decker bus in Aberystwyth presumably transferred from London, will more powers for the Welsh Assembly follow? There is, as far as I can tell, only one solution: full devolution of everything that can be handled on a more-local level. With only matters such as defence left under the control of the Westminster parliament, local representation in the house of commons would be far less important. In such a scenario, Westminster constituencies could be even fewer in number, perhaps just one for the whole of Wales, with a larger number of members in each. That would also be more-proportional, since the most-proportional system of all is one which does not have constituencies at all but simply allocates all the seats based on each party’s share of the national vote. Please excuse this somewhat hyperbole post, but I wanted to highlight the debate in the commons tomorrow and did not have enough time to comment. Hopefully ‘normal service’, as far as this autumn is concerned, will be resumed next week with the continuation of the report of my holiday in Leicester due. This is the third instalment of my Midlands rail adventure write-up, following on from Rutland Ramblings. 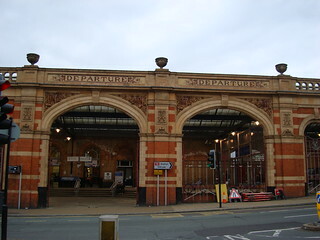 No Chance: ‘Departure’ arches at Leicester station (photo taken later in the week). Planning for Sunday 13th August was frustrated by a terrible timetable. As part of my holiday I wanted to travel over the Erewash Valley Line, the direct route from East Midlands Parkway to Chesterfield passing Toton TMD (Traction Maintenance Depot). Prior to the trip, I had established that the route had hardly any passenger services, but on Sundays a 10:08 service from Nottingham was booked to use part of the route, including passing the TMD. I had decided to aim for that service (and then going from Chesterfield to Birmingham to see the Shakespeare Express) but was horrified to discover that there were no northbound services from Leicester before 10am on a Sunday. Thus thwarted, I was forced to abandon the idea of riding the Erewash Valley Line. We therefore reverted to our Heart Of England (3-in-7 days) Rover tickets earlier than planned and went directly to Birmingham New Street on the 10:22 from Leicester (CrossCountry’s 170101). With very little rail mileage the previous day (all of which was using the ‘East Midlands Rover’), I was keen to make the most of the rover and so added a return trip from Birmingham to Redditch which also helped fill the time that would have been spent on the trip up to Chesterfield. The third day of the ‘Heart Of England’ rover would be used later in the week for our return journey to Wales. For the Redditch trip, we travelled on London Midland’s 323202 which was coupled to a second class 323 to form a longer train on the 11:45 from Birmingham. We did not note down the departure time from Redditch (which was 12:27) on the day’s itinerary, so to avoid the risk of being left behind I didn’t even step onto the platform there to take a look at the station. Back at Birmingham New Street I was very pleased to discover that there were open toilets (as opposed to ones behind a pay barrier as some other large stations managed by Network Rail have). This forced me to somewhat adjust my opinion of the station, which I had previously considered a hell-hole to be avoided like the plague. We then headed out of the station in search of Birmingham Moor Street, somewhere I’ve wanted to see more of ever since my first visit, which was rather brief. On the way between the stations we took a wrong turn but happily still managed to find Birmingham’s attractive GWR station with ample time for a look round. 5043 ‘Earl of Mount Edgcumbe’, heading north, then brought ‘The Shakespeare Express’ into the station at around 13:36 and off into the tunnel to Birmingham Snow Hill. The station still has a water tower and water crane, though I’m not sure if they’re connected together so using it as a water stop for the ‘Shakespeare Express’ might not be possible. The station looks quite authentic but on closer inspection I was dubious about some of the colours used; rather than just ‘light stone’ and ‘dark stone’ there seemed to be at least three shades in use. There was also a baby changing facility, which my grandmother informed me the railways didn’t have in the old days. The signage for it though did not look at all out of place, it being in the same white-on-black style as the rest. It really is a very good-looking station. 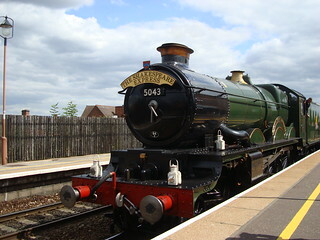 5043 then returned, just after 14:00, now running tender-first towards Stratford-upon-Avon. I was disappointed that the Hall class locomotive originally advertised for the Shakespeare expresses had not been reinstated, but at least that allowed me to drop the idea of taking a bus to capture it away from a station. Also, assuming the Hall would have been tender-first southbound as the Castle was, I wouldn’t have been able to get the photograph I wanted of it at Moor Street anyway. At 14:30 we set off in pursuit of the Castle-hauled train on a service formed of 172212 and 172221. 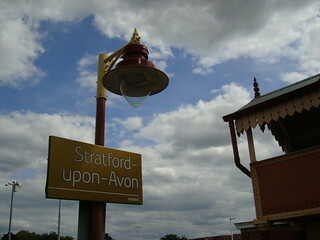 Stratford-upon-Avon station is sadly not the picturesque sight that Birmingham Moor Street is. 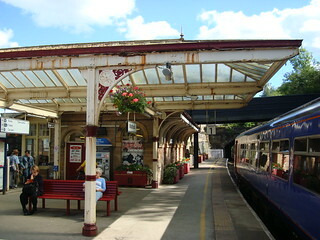 It does retain a traditional station building, complete with canopy, and what looks like a GWR footbridge. The latter however is obscured on one side by a modern footbridge in a horrible pink colour and some of the station name-boards have a rather odd-looking golden background (rather than London Midland’s normal black). 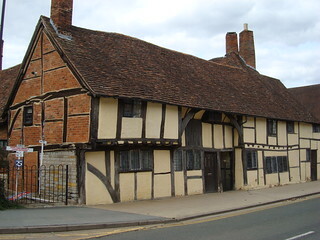 The town however has quite a selection of attractive old-looking buildings, although by the time we had reached the Royal Shakespeare Company theatre my grandmother was so fed up of the crowds of other tourists that we did not continue to find their other theatre. Instead we headed back towards the station on back streets that, thankfully, most of the other visitors hadn’t noticed. 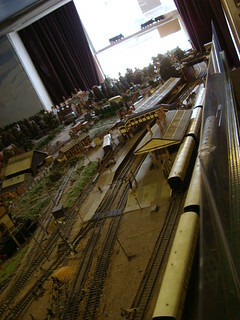 The railway exhibition we had seen advertised on the way down to the theatre was closing when we passed it on the way back, but they did let us in for a quick look at one of their model railways. 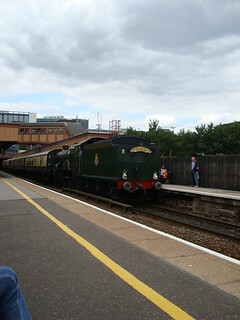 We made it back to the station in time to see ‘Earl of Mount Edgcumbe’ making a disgraceful departure from Stratford-upon-Avon. Clouds of filthy black smoke were emitted and barely any acceleration achieved; I think it even slipped a little soon after finally making it passed the end of the platform I was standing on. Our train back to Birmingham was shorter that the one we had arrived on, a single 3-car class 172 unit instead of a four carriage formation. 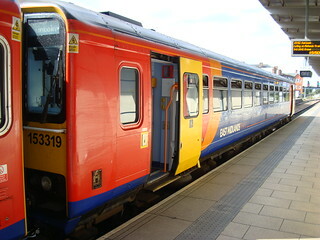 Our 3-car unit was 172334, forming the 16:29 departure from Stratford-upon-Avon. Rather than alight at Birmingham however we stayed on-board through to Smethwick Galton Bridge. Unfortunately the ‘Galton Bridge’ itself (which I think takes a road over the canal below) could not be easily photographed owing to the sides of the railway bridge that the Snow Hill line platforms are located on. We then returned to Birmingham Moor Street on the 17:46 service (172341) and managed to find our way back to New Street without the detour we had made earlier. Finally, 170637 took us back to Leicester. On this leg, as on the outward run, we were puzzled by a grand building not far from a reservoir. A quick survey on Google Earth as a write this has revealed that this was probably Whitacre Water Works, just east of Water Orton. Following a period of ‘competitive dialogue’ with four possible partners, the Welsh Government (or their relatively new ‘Transport For Wales’ body) finally issued the Invitation To Tender (ITT) for the next Wales & Borders rail franchise in the past week. This time next year, the current Arriva Trains Wales franchise should be just a few weeks away from coming to an end. The pre-qualified four are Abellio Rail Cymru, Arriva Rail Wales, KeolisAmey and MTR Corporation. The winner will be an ‘Operator and Development Partner’ (ODP), required to play a bigger role in the development of infrastructure than train operating companies in the UK have done since privatisation. Therefore, at least some of the bidders for the new contract are joint-ventures involving an infrastructure firm along with one of the ‘usual subjects’ in UK franchise contests. Not all the ‘usual subjects’ are represented though, First Group and Stagecoach are conspicuous by their absence from the line-up. That leaves subsidiaries of foreign railway companies leading the four hopeful groups. Arriva belongs to DB, the state-owned railway of Germany, Abellio to NS (Nederlandse Spoorwegen, the Dutch state-owned railway), Keolis to SNCF (owned by the French state) and MTR (in part) to the Hong Kong Government. 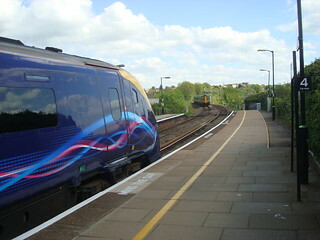 HOWL Of Pain: a class 150 on the Heart Of Wales Line. Will four hour journeys on uncomfortable trains like this be eliminated in the new franchise? The short listed bidders now have a little while to work up a final tender to submit to the Welsh Government / Transport For Wales. Most sources are reporting that all four bidders are still in the game, but there have been suggestions that only Arriva and Abellio remain in the contest. With any luck, the claims that the franchise will still be awarded by the end of February 2018 (despite a delay to the devolution of the powers for awarding the franchise to the Welsh Government) will prove true, allowing the new regime to begin in October 2018. It is also to be hoped that the new contract will offer widespread improvements. 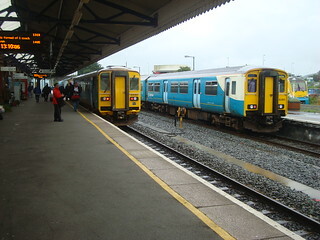 However, unlike in DfT-led franchise competitions, the Welsh Government have not made many of the requirements in the ITT public for the new Welsh contract. At this point then, it is all a mystery. Fingers crossed everyone. Part Two of my August 2017 holiday log (continued from part one).